Any caterer can slap tomatoes, buffalo mozzarella and basil together and serve it to 1000 people. That’s what caterers do, after all. It’s their job to create and serve meals at events such as weddings, bar mitzvahs or corporate parties with hundreds — sometimes thousands — of guests. That there can also be space for a truly innovative chef in this field is a lovely surprise. 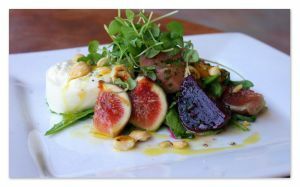 Erez Levy of Studio City is that surprise and our good fortune… for rather than spend his time cooking in some four-star restaurant, he can come right into our homes with Savore Cuisine and Events, creating culinary magic with dishes that rival those found at Taillevant or Le Maurice in Paris. Quite simply, Levy’s food doesn’t just have substance – it has style. On Savore’s Facebook page, there is a small quote that reads, “There is no love sincerer than the love of food,” and it shows – just look at the photos of some of the food from their past events. Levy and partner Richard Lauter both spent time at Spago Beverly Hills, among other restaurants, before teaming up to create Savore Cuisine and Events in 2001. Since then, they have been creating exquisite sit down dinners, tasting menus, and thematic station events for a long list of clients that include celebrities, politicians, magazines, television and film studios, fashion designers and corporations. 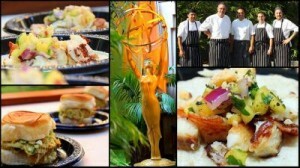 Savore recently produced, designed and catered a slew of Emmy parties. They have participated in countless charities, including the annual P.S. Arts Fair and the Concern Foundation’s 35th Annual Block Party at Paramount Studios. Savore recently designed, produced and catered a slew of Emmy parties, along with receptions for television shows, including “The Office,” “Mad Men,” “Ugly Betty,” “Lost,” “The Wire,” and “Entourage,” to name a few — as well as political dinners for the likes of Nancy Pelosi and Tony Blair. Recently, Michael Morrisette joined the partnership, adding another impressive culinary resume, including stints working with celebrity chef Josiah Citrin, and as General Manager for restaurants such as Melisse, Café del Rey, Maple Drive and La Cachette, just to name a few. 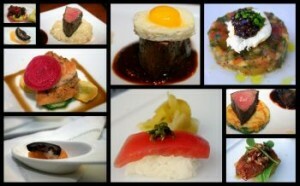 To call Savore a catering company is almost a disservice, though. Levy and his partners are more like an unbelievable restaurant on wheels. Most caterers do a fine job of competently preparing and serving very good meals at events. The list of those who do so with passion, creating such ambrosial dishes as miso black cod with sweet corn and shishito peppers or cauliflower cappuccino with poached quail egg and French truffle is short. Erez Levy and Savore are at the top of this list. Better yet, they are right here in your own backyard. I’ve had the privilege to use Erez services in events we had, big and small. Erez, his team and his food were the highlight of the evening on every one of our events. Today, service needs to stand out from the crowd. Thanks for the new resource. This will help my clients feel they are important to my business.